This is a dynamic collection of fiber-related photos fetched on Flickr with Yahoo!Pipes. Created and published in less than 2 minutes. This is the exact same collection, geocoded. Cool, huh ? I've revamped the Fiber On Demand blog. Was a matter of a few clicks only, thanks to Yahoo!Pipes (see the features in the previous post). Aggregating content from different sources onto a single web page has never been so easy. Just missing a 3D/whirling/magnifying carousel, which will be available in a next release I guess. See Fiber On Demand here. Subscribe to the RSS feed here. I've updated the FiberNews site. After a few months out in the wild space of the blogosphere, it was time for a first revamp. First modification : more news, coming from more online resources - adding RSS feeds with Yahoo!Pipes is just a matter a seconds. Second modification, thanks to the new "Get a Badge" feature : replacement of the Google Map mashup by the Yahoo Map, directly from Pipes. Just outstanding. It's mashup for the rest of us. You can visit FiberNews here. Add the FiberNews as a badge on your own site, or get the RSS feed, JSON, PHP, KML and more - including getting the results by email or phone - here. My public pipes are available here. Feel free to copy, paste, and use. 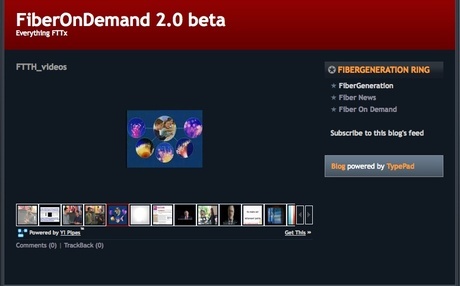 Please welcome the new member of the Fibergeneration family : FiberNews ! 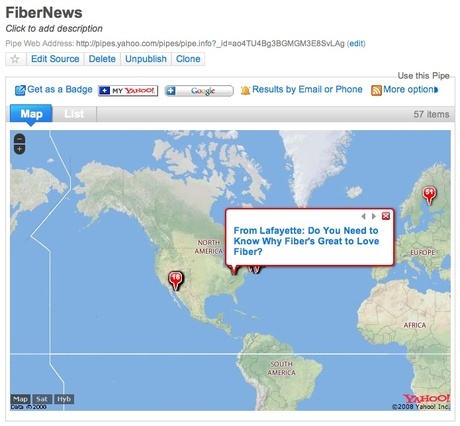 FiberNews is a GoogleMap mashup, displaying FTTH Fiber-To-The-Home related news per their respective location. See the previous post here. Created with Yahoo!Pipes and GoogleMaps, of course. 6. embed it in a blog post. Next steps : a) add more news feeds - for the time being, that's only Fiber Optics Online and The New York Times, b) add a Yahoo!Maps display, to compare with Google's, c) test new ways to show information, as on Babelcast for instance. You can see, use, and copy the fibernews pipe here.